Capelle, Netherlands. Laid down by A.Vuijk & Zonen a/d Ijssel for A/S D/S Inga (Meier) Kristiania, Oslo, Norway as a 943-tons cargo ship. Completed and registered at Oslo, Norway. INGA is chartered to RS Lamb & Co., Sydney that same month. Placed on Newcastle, Australia ~ Auckland, New Zealand route. Departs Merauke, Dutch New Guinea. Arrives at Cairns, Queensland, Australia. Departs later. Calls at Newcastle and Wanganui, New Zealand. Calls at Hokianga and Sydney. Calls at Gisborne, New Zealand ~ Auckland ~ Kaipara, New Zealand and Aoroa, New Zealand. Departs Aoroa and sails towards Sydney. Later that day, collides with an unidentified ship off Toka Toka coast and returns back to Aora. Departs Aoroa again and arrives later at Auckland. Calls at Newcastle and Suva, Fiji. Calls at Nydia Bay and Greymouth, New Zealand. Runs aground in Wanganui River estuary. Departs Newcastle and sails towards Wanganui. Runs aground off Cape Egmont coast. Arrives at Wellington, New Zealand. Enters drydock for two weeks of provisional repairs. Departs Wellington and calls at Greymouth. Departs there and arrives at Sydney for permanent repairs. Calls at Newcastle and Wanganui. Calls at Sydney and Gisborne, New Zealand. Calls at Newcastle ~ Wanganui ~ Greymouth and Sydney. 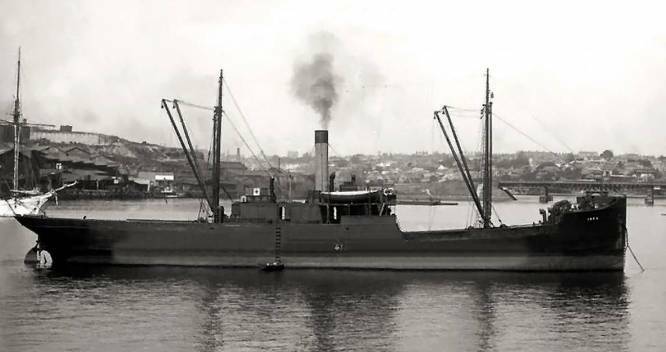 Her owners are changed to James Patrick & Company Ltd. Placed on the Sydney ~ Melbourne trade route. Her owners are changed to W.R. Carpenter & Company Ltd. and her registry port to Wellington. Her registry port is changed to Tulagi, Solomons. Her owners are changed to Madrigal & Company Ltd. and her port of registry to Manila, Philippines. Ship number is changed to 181286 and INGA is renamed CETUS. Call sign is changed to MDVH. Call sign is changed to KZCS. Her owners are restyled to Madrigal & Company Inc.
Taken over by Japanese Forces. At Appari, Philippines. Inspected by auxiliary gunboat KISO MARU. Ship’s inspection due to be completed under instruction No. 8. Departs Appari. Arrives at Mako, Pescadores. At 1600, various inspections due to be carried on ship under instruction No. 9. At 1300, meeting is held in conference room. Undergoes repairs at Mako Naval Yard. Renamed HOKUHI MARU. Call sign is changed to JLER. Repairs due to be taken over from 8 Mar ‘42 by Mako shipyard’s Hatsumoto Takashi under instruction No. 16. Arrival of Mako shipyard’s personnel under instruction No. 18. Mako shipyard’s personnel takes over repairs. Departs Mako Naval Yard and arrives at Kirun, Formosa (now Keelung, Taiwan) later that day. Maintenance directive No. 5171 is issued. Departs Kirun and arrives at Takao, Formosa (now Kaohsiung, Taiwan) later that day. Departs later for Mako. Mako Guard District naval repair unit reports completion of repairs. Departs Mako. Loads 900-tons of coal, 50-tons of building materials and 262 empty drums. Arrives at Kirun. Departs later. At 1330, departs Mako in convoy No. 721 also consisting of IJA transport PACIFIC MARU and four unidentified merchant ships escorted by destroyer FUYO. The convoy splits into two parts after departing port. HOKUHI MARU is in the second part. Arrives at Zamboanga, Mindanao. Departs later. Registered in the IJN as an auxiliary transport attached to the Sasebo Naval District with Sasebo as homeport under Navy’s instruction No. 8. Assigned to Vice Admiral (Admiral posthumously) Takagi Takeo’s (39) Mako Guard District, transport unit. Call sign is changed to JWSY. Enters drydock for maintenance and repairs. Arrives at Mako. Departs there later in the day. Assigned to Mako Guard District as an auxiliary transport (Otsu) category under Mako Guard District secret instruction No. 6. .
Departs Takao and arrives at Kirun later that day. Departs Kirun and arrives at Takao later that same day. Departs Takao and arrives at Mako later in the day. Departs Mako and arrives at Takao later that day. Departs Takao and arrives at Kirun later that same day. Departs Kirun and arrives at Takao later in the day. Departs Takao for Manila in convoy No. 748 also consisting of auxiliary emergency oilers KOSHIN and SEIAN MARUs, auxiliary transport EIKO MARU No. 2 GO, and two unidentified merchant ships escorted by minesweeper W-21. Departs Manila and arrives at Zamboanga later that day. Departs Zamboanga and arrives at Manila later that same day. Departs Takao and arrives at Kirun later in the day. Departs Kirun and arrives at Mako later that day. Departs Mako and arrives at Takao later that same day. Departs Kirun and arrives at Takao commercial port later that day. Departs Manila and arrives at Cebu, Philippines later that day. Loads 470-tons of coal and 177-tons of miscellaneous goods. Departs Cebu and arrives at Sagay, Negros, Philippines later that same day. Arrives at Cebu. Replenishes 80-tons of coal and loads about 21-tons of wood. At 1650, departs Cebu in convoy also consisting of IJA transport TAIEI MARU escorted by patrol boat PB-103 (ex-USS FINCH). At 1158, arrives at Manila. Departs Manila in convoy No. 860 also consisting of IJA transport CLYDE MARU escorted by destroyer SHIOKAZE. Departs Kirun and arrives at Mako later that same day. Departs Mako and arrives at Takao naval base later in the day. Departs Takao and arrives at Mako later that day. Departs Mako and arrives at Kirun later that same day. Departs Kirun and arrives at Mako later in the day. Departs Mako and arrives at Kirun later that day. Departs Kirun and arrives at Takao commercial port later that same day. At 0800, departs Takao in convoy with tug KEISHU MARU (ex British HENRY KESWICK). Arrives at Takao naval base. Departs later. At 1055, departs Manila for San Fernando escorted by patrol boat PB-103 (ex-USS FINCH). At 2115, anchors off Vigan. Arrives at Karenko (now Hualien), Formosa. Departs Karenko and arrives at Takao later in the day. Departs Karenko and arrives at Takao later that day. Departs Karenko and arrives at Takao later that same day. Arrives at Takao Shingang. Loads about 900M3 of wood. Arrives at Takao naval base. Departs Takao naval base and arrives at Takao commercial port later that day. Loads 200-tons of cement and 57-tons of fertilizer. Arrives at Karenko. Loads about 14-tons of Paulownia logs and other wood. Departs Takao naval base and arrives at Karenko later that same day. Arrives at Takao commercial port. Departs Takao commercial port and arrives at Mako later that day. Arrives at Takao. Loads 1,000-tons of Takao charcoal. Departs later. At 1600, arrives at Takao naval base. Departs Takao naval base and arrives at Takao commercial port. Loads 300-tons of briquettes. At 1200, arrives at Kirun. Loads 900-tons of Takao charcoal. Loads 600-tons of coal, 200-tons of briquettes and embarks 120 passengers. Departs Takao commercial port later that day. Departs Cebu and arrives at Sagay later that same day. Loads about 20-tons of wood. Departs Sagay and arrives at Cebu later in the day. Assigned to troop transport mission under Mako Guard District secret instruction No. 16. Departs later. At 1445, departs Cebu in convoy M-17 also consisting of IJN requisitioned shared tanker (B/C-AO) JANBI MARU, IJN requisitioned shared transport (B/C-AK) BUGEN (ex-American KOLAMBUGAN) MARU, IJA transports SHOGEN MARU and NIKKO MARU No. 1 escorted by patrol boats PB-103 and PB-105 and auxiliary subchasers YATSUSHIRO MARU and KYO MARU No. 2. At 1515, the convoy arrives at Manila. HOKUHI MARU is detached from the convoy. Arrives at Kirun. Loads 1,000-tons of Takao carbon blocks. Departs there later in the day. Arrives at Takao commercial port. Departs later. Arrives at Takao commercial port with IJN requisitioned shared transport (B/C-AK) BUGEN (ex-American KOLAMBUGAN) MARU. Loads 500-tons of alumina, 500-tons of heavy oil, ammunition and other sundries. Departs Takao commercial port. At 1815, departs Takao for Mako. S of Mako. At 0300, USAAF 5th AF Consolidated B-24s “Liberators” attacks shipping in the area. HOKUHI MARU is bombed and hit aft causing heavy flooding. Personnel and confidential documents are transferred to Boat No. 210. The transport sinks at 23-35N, 119-35E with unknown casualties. Removed from the Navy’s list under instruction No. 417.